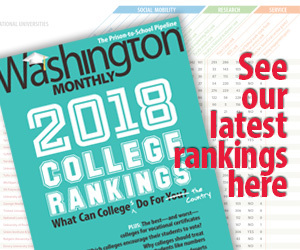 Washington Monthly | For-Profit Colleges and Republican Support? For-Profit Colleges and Republican Support? Fast-growing for-profit colleges, under fire for saddling students with unmanageable debt, are rolling out new policies aimed at raising graduation rates while also hoping a Republican-controlled House will block unfavorable legislation. “We have a great opportunity to educate (the newly elected representatives) on the value our sector plays in the higher education system and the economy,” said Harris Miller, president of the 1,800-member Association of Private Sector Colleges and Universities (APSCU). In fact, both criticism of and support for America’s for-profit colleges has been curiously bipartisan thus far. For-profit colleges are very dependent on federal student aid. And low-income Americans are disproportionately represented at for-profit colleges. The businesses, therefore, represent both hugely wasteful government programs and the only way many poor Americans have been able to access college in recent years. As for Harris Miller and his “great opportunity” to educate new representatives, well there are 72 new representatives. 63 of them are Republicans.